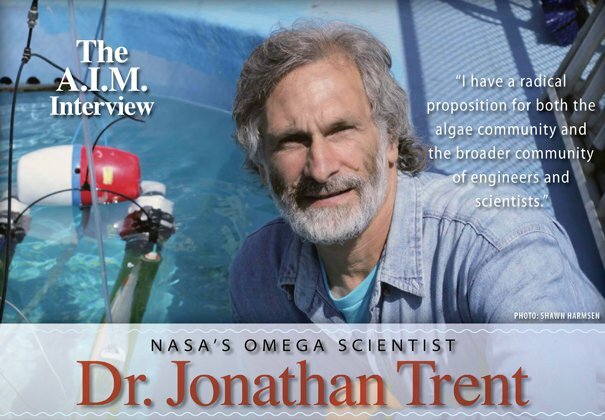 ASA scientist – the inventor, heart, and soul of the OMEGA system (Offshore Membrane Enclosures for Growing Algae) – Dr. Jonathan Trent received his PhD in biological oceanography at Scripps Institution of Oceanography. He went on to post graduate work in Europe studying the biochemistry and molecular biology of microorganisms living in geothermal hot springs, the so-called “extremophiles.” He continued his work on extremophiles at Yale Medical School and discovered a class of proteins in these unusual organisms that is closely related to a class of proteins in humans. We spoke with Dr. Trent recently to get an update on where things are currently with the OMEGA project and his view of its, and our, future. How did the OMEGA program get started at NASA? One of the interesting projects of my nanotechnology group at NASA was self-assembling multi-enzyme arrays on a stable molecular scaffold we borrowed from an extremophile. One of the arrays we were working on was to improve the degradation of cellulose, using a variety of enzymes in that pathway. It was an interesting project and brought my attention to biofuels. You know there are two “holy grails” for biofuels, one is cellulose degradation and utilization and the other is microalgae. With my background in marine science, microalgae was a natural for me and I quickly dug into that literature. I realized almost immediately that one of the biggest hurdles for making algae into biofuels is the problem of scale and that’s what I wanted to address. If you consider the scale of algae cultivation required to meet our current appetite for fuels and you put that in the context of the growing world population with food and water requirements, it is clear that whatever we do to make algae biofuels cannot compete with agriculture. For me this meant that we can’t use freshwater and we can’t use fertilizer, and in my view we can’t even use land. I don’t buy the argument about using the so-called non-arable land for algae cultivation, because if we made all the effort of transporting water and fertilizer to non-arable land to grow algae, why wouldn’t we make it arable land and start growing food on it? I suppose if we were pumping seawater to the non-arable land it would be another story, but in general pumping water is energy intensive and not cost effective. In any case, back in 2008, thinking about all the problems associated with super-large-scale algae cultivation, I had the inspiration for Offshore Membrane Enclosures for Growing Algae (OMEGA). We’ve been working ever since then to prove or disprove the feasibility of this offshore approach. Give us your elevator pitch on the OMEGA System. Well, given that some species of microalgae are the fastest growing biomass on the planet and the best oil producers, we can probably agree that algae are the organism of choice for biofuels. If we further agree that biofuels production cannot compete with agriculture for freshwater or fertilizer, which means to me we have to use domestic wastewater to grow them, then let’s consider our options. I think the fact that in all our coastal cities we already have the infrastructure for “disposing” of our wastewater offshore, we need to consider the possiblity of using this wasted water and the existing infrastructure for growing microalgae offshore. In addition to using wastewater from existing offshore outfalls for developing algae systems, there are other good reasons for OMEGA, I mean float photobioreactors (PBRs) in seawater. For example, there’s the heat-capacity of the seawater that can be used to control the temperature of the PBRs –temperature control of PBRs on land is a huge and expensive problem. The sea provides other energy savings also. Wave action can be used for mixing and the salt gradient can be used for forward osmosis, which not only cleans the wastewater released into the sea, it also concentrates the algae for harvesting. If the freshwater algae cultivated in wastewater escape into the surrounding seawater they die (freshwater algae can’t survive in salt water), which means they will not become invasive species in our coastal waters. The OMEGA structure itself can be used as an enormous substrate for developing aquaculture to grow edible seaweeds, mussels, oysters, or some other marine “crop” appropriate for the local conditions. If you see where this is going, OMEGA is a system of systems or an “ecology of technologies” – in which the concept of waste disappears: a waste product from one part of the system becomes a resource for another part. As far as possible the whole system, which includes the environment, is in balance. In other words, we use algae to treat wastewater and wastewater to grow algae. We use carbon dioxide to grow algae and algae to sequester carbon dioxide. We use the inside of the OMEGA PBR to contain algae and the outside to produce aquaculture crops. We use the salinity gradient to prevent algae from becoming invasive species and to drive forward osmosis and to further clean the wastewater. We use solar energy, wave energy, and the heat capacity of the water. It’s all rather exciting and it’s very much like what NASA is developing for closed life-support systems for long-duration space exploration. Well, I realize that was a long elevator pitch, but this is an important topic to consider on many levels of detail! I guess we’ll need a very tall building to do an elevator pitch for OMEGA! So how far along is the project at this point? The project was initially generously funded by the California Energy Commission, which was enough to get us started. And then by luck and serendipity I had a chance to present the OMEGA concept to Lori Garver, the Deputy Administrator of NASA. Lori immediately understood that not only was this technology an important spin-off from the kinds of closed life support systems that NASA has been developing for decades, but it is precisely the kind of technology that NASA gives back to society and to the world. Lori’s insight and understanding of the potential of OMEGA led to additional funding through the “Green Aviation” initiative at NASA. Within a few months we completed Phase One, a 400-page paper study that considered possible materials and designs, hypothetical deployment locations and logistics, and estimates of energy return on investment, life-cycle analysis, etc. Based on Phase One results and an external review, we were encouraged to proceed with Phase Two, which is in progress and focuses on building and testing prototype PBRs as well as the OMEGA system components in the lab and in seawater tanks. Phase Two is underway at two locations: a California Fish and Game lab in Santa Cruz and a wastewater treatment plant in San Francisco. The Santa Cruz lab is our “skunkworks,” where we are experimenting and testing floating PBR and system designs. We have two large seawater tanks and thirty-four 250-gallon tanks in which we are studying biofouling on different types of plastic. We grow algae on wastewater from the Santa Cruz wastewater treatment plant, which we collect in 50-gal drums and pump into our floating PBRs. We bubble the algae with an 8-10% CO2/air mixture to mimic flue gas. 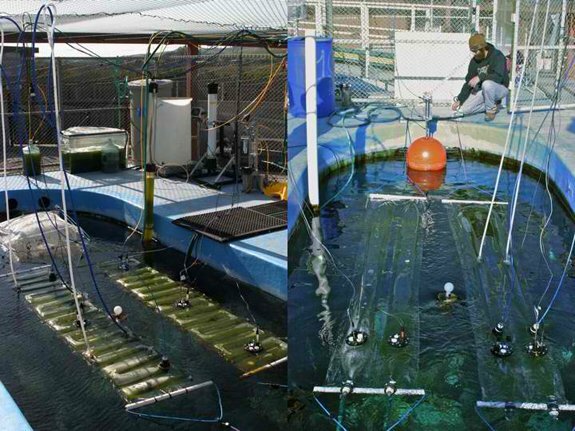 In one of the large tanks we have a wave generator and analytical equipment for the PBRs to continuously monitor pH, dissolved oxygen, temperature, photosynthetically active radiation (PAR) and photosynthetic efficiency using Fast Repetition Rate Fluorometry (FRRF). The inventors and developers of FRRF, Zbigniew Kolber and Sasha Tozzi, are on our team and their instrument has been a boon to our research. It continuously takes the photosynthetic “pulse” of the algae cultures, indicating biomass accumulation and the effects of light, nutrient, and oxygen. It’s an important tool in our studies. We also have an instrument called a zetameter, which tells us about the surface charge of the algae and indicates when to harvest them. The other location we have for experiments is in San Francisco at one of the wastewater treatment plants. We have an agreement with the city of San Francisco’s Public Utilities Commission to use four big tanks there. They were dissolved air flotation tanks that haven’t been used in years. With help from the plant workers and our contractors, these four tanks were cleaned out and filled with SF bay water. With a bit of additional plumbing for wastewater and flue gas we are preparing to do experiments with floating PBRs in these tanks. The goal is to test our designs and ideas developed on a small scale in Santa Cruz on a larger scale in San Francisco. Our current funding gets us through Phase Two, which should culminate in some reasonable designs for scalable floating PBRs, some algae growth data in small-scale PBRs, an energy return on investment supported with actual data, and some estimates for what it will take to obtain permits and do a commercial-scale system. Our broad objective is to complete this pragmatic analysis of OMEGA feasibility based, not just on biofuels, but on other products and services as well, by the end of 2011. What strains are you working with, and is the system optimized for any particular strains? We’re working primarily with Chlorella vulgaris, because it’s one tough bug and grows really well in wastewater, but dies quickly in seawater. We wanted to test an organism that is well known and is a natural strain – not a genetically modified organism. 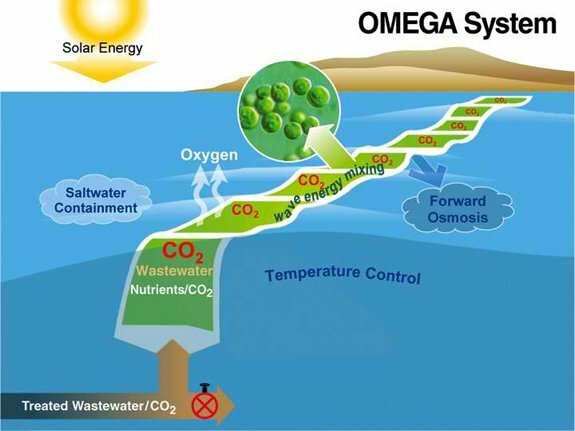 I should add, however, that the OMEGA system is agnostic with regard to what algae go into the system provided: 1. The strain grows well on wastewater and 2. It dies in saltwater; as I said, the key is that if the OMEGA system leaks, it is not introducing invasive species into the marine environment. In fact, the freshwater algae will not only die in seawater, they are also bio-degradable. How is the algae harvested? There are lots of people working on improving harvesting methods and this is outside the scope of the OMEGA project. We are testing some different harvesting methods however, because ultimately we’d like to find or adapt a method that we can incorporate into the continuous, flow-through system we are developing. There are a lot of clever possibilities emerging. Describe a little more about the physical properties of the system. The OMEGA system we are now testing on a small scale consists of manifolds connected to floating clear flexible plastic tubes, pH/dissolved oxygen/temperature sensors control systems for pH, gas exchange columns, and harvesting systems. Wastewater is the source of nutrients and photosynthesis occurs primarily in the plastic tubes. Dissolved oxygen is removed as the culture falls through an airspace in the gas exchange column, while the pH is controlled and CO2 is added by bubbling flue gas through the water in the column. When the algae reaches a density that limits photosynthesis, it is shunted to an experimental forward osmosis chamber to pre-concentrate, and then to a harvesting chamber. Wastewater is added back to the system to maintain a supply of nutrients and a concentration of algae optimum for photosynthesis. In other words, we want to make sure that the algae never gets so dense that we’re just harvesting photons in the upper few millimeters of our bioreactor, but we are harvesting enough algae biomass to cover the energetic costs of harvesting. To optimize mixing and light exposure, the culture is pumped passed swirl veins, which move the algae along a helical path down the tube. At commercial scale each module would be between 50 and 100 feet long. Obviously, pumping water through the system is going to have the biggest energy requirement. We’re looking at wind, wave, and solar energy to supply most of this energy. Is OMEGA wastewater dependent at this point? 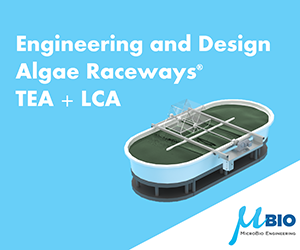 Many of us in the algae community agree that we have to use wastewater for large-scale algae cultivation so as not to compete with agriculture, but also to meet economic requirements. If you look at our major cities, the wastewater systems tend to be embedded in the city. Take San Francisco, for example. It’s about 45 square miles and there are three wastewater treatment plants. The plant at Hunters Point, handles 65 million gallons a day. If you tried to build ponds around the wastewater plant, you’d have to displace freeways and all kinds of infrastructure. Just to deal with five day retention time you need about 1200 to 1500 acres of ponds, and it has to be on level land, which is really hard to find near San Francisco. On the other hand, if we were to somehow float algae photobioreactors in San Francisco Bay and use the wastewater currently pumped offshore, we would use less than one percent of the huge area of the Bay and in the worst case we would displace a few fishermen – actually we’d probably improve the fishing in the Bay. Well, then the issue is, can we do this? Can we figure out how to cultivate algae in offshore environments? There will undoubtedly be somewhat different solutions for each location and some places will be impossible, but what do the easiest solutions look like? I’m hoping to be able to get support for the next Phase of OMEGA, which will be the first marine deployment in a bay somewhere. I’m hoping to do this with the US Navy, but time will tell where it will happen. What are the biggest obstacles you’ve been dealing with in getting the OMEGA system into full deployment? I think that there are four major areas with formidable hurdles some of which apply to all algae systems and some of which are particularly true for OMEGA because it’s not an established technology. Biology, which includes finding the right strains of algae that grow well in wastewater and form a stable community. For OMEGA, they also have to die in seawater. Engineering, which is a problem in the OMEGA system because the marine environment is daunting both in terms of materials and corrosion as well as strength and longevity with 5, 10, and 100 year storms. This depends on where you are, but even in places like the North Sea there is some pretty amazing engineering going on to pursue oil in deep water. 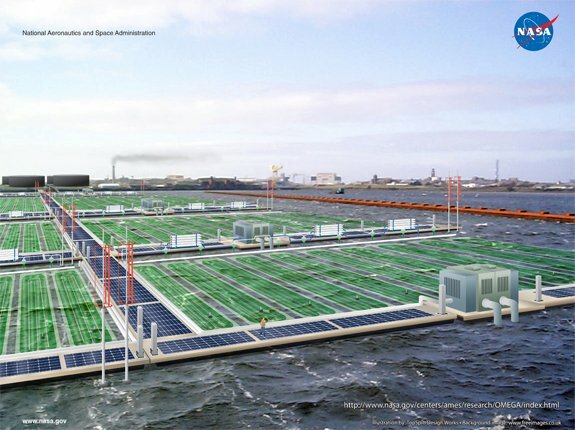 In addition to deepwater oil drilling platforms, there are plans for large floating airports and even floating cities, being developed in Holland to anticipate sea level rise. I somehow think our engineering ingenuity is up to the challenge of developing OMEGA systems at least in protected bays for now, in the new bays that will form in the future with sea-level rise, and maybe someday in the open ocean. Economics, the OMEGA project itself is facing an economic crisis of sorts because we are going to run out of money at the end of this calendar year and we are looking for funding for our next Phase, but that’s not relevant to the overarching economic challenge. 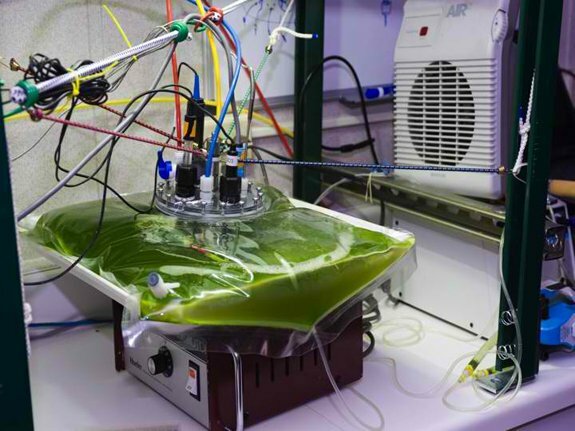 In general, the economics of large-scale algae cultivation for a commodity like biofuel, is considered a major issue. I would argue that the economics of an OMEGA system will be based on the integrated system of both products and services. The products include algae biofuels, biogas, fertilizer, and aquaculture harvests. The services include wastewater treatment and carbon sequestration and to some degree environmental remediation, if OMEGA can be used like the “turf scrubber” system. Environmental obstacles, which have environmental impact and social components. The marine component is how OMEGA impacts the local marine environment. The fact that it’s going to clean up wastewater outfalls is a positive impact, but there are open questions about marine mammals and sea birds, and shading the local eco systems. I think the overall impact will be positive, but that remains to be determined. The “social environment” component involves obtaining permits, and jurisdiction, and competition for space with stakeholders like shipping companies, fishermen, and recreational boaters. All these issues depend on where we are and how sensitive we are to the conditions in the marine environment. What would you say are the significant breakthroughs or major refinements needed to make this system a more elegant solution? It would be great if one of our industry colleagues came up with a really good oil producing strain of algae that grows well on wastewater and outcompetes everything else. But those kinds of breakthroughs I leave to others. From our perspective, we have been working on how to get the hydraulics of the flow-through system to work and how to control gas exchange so we don’t poison our algae with oxygen, and we provide them with adaquate supplies of CO2. We’ve got a system working now that we’ve developed at our “skunkworks” where we are measuring and monitoring how quickly the algae are removing the nutrients from the wastewater, and how we can balance our wastewater input to keep the algae growing, and balance the harvesting and the gas exchange. We think we’ve cleared – just in the last month or so – some major hurdles with regard to the hydraulics and the whole biological balancing act that we need to do to keep the algae growing. Time will tell if this system is stable over the course of months. The good news is the system we have now seems to be quite scalable at least in principle. In a natural environment, there are going to be issues with materials and design to cope with stresses from currents, waves, and wind as well as biofouling. But I’m more optimistic than ever about the feasibility of OMEGA. What do you think needs to happen, not just for the OMEGA project but for the future of this industry in general? If you mean the algae industry as a way to make biofuels, my personal opinion is that the US should be investing the kind of money and brainpower that we invested in the Manhattan project and Apollo. The Manhattan project was an investment of something like $22 billion (in 2008 dollars) over a five year period. And the whole Apollo program was about $98 billion over 14 years. They were amazing government-funded programs that mobilized the best and the brightest, actually from all over the world to reach socially and scientifically important goals. Given the importance of liquid fuels, not only to the transportation industry, but to so many aspects of our society, and considering both the limited availability (peak oil and the location of reserves) and desireability (environmental impacts and national security) of fossil fuels, it’s time we make the transition away from fossil fuel dependence. The fossil fuel industry is nearly 150 years old and it represents some $5 trillion a year in revenue. I think if we want to maintain a semblance of our lifestyle in the future, we need to seriously ask ourselves what it will take to replace the bulk of the fossil fuels we are currently using with sustainable, carbon neutral biofuels and can we do this in the next five to ten years? Then, we as a nation, should take on that enormous challenge with the determination of the Manhattan Project and the enthusiasm of the Apollo mission. With our current focus on the “economic crisis” I don’t know if the U.S. is up to this challenge. On the other hand, if we can invest over $1.2 trillion in the last ten years for wars in the middle east, perhaps we can find the resources to secure our own energy sources, energize a green economy, and make those wars obsolete. Are you passionate about algae? Ha ha! Well I guess if you haven’t noticed by now I’m passionate about algae, I’m passionate about the oceans, I’m passionate about the environment and I’m passionate about finding a way forward for the growing population of human beings that is sensitive to the environment and responsible on the global scale. Above all, I’m passionate about finding a sustainable, carbon-neutral energy supply and I think algae can be part of that supply. Why? Because, while I know it’s incredibly difficult to make meaningful predictions, the Intergovernmental Panel on Climate Change (IPCC) has made some daunting predictions about global changes that seem plausible to me as a scientist. Among other things, the IPCC is predicting that we are changing the climate, acidifying the oceans, and that our activities threaten 40% of known species with extinction by the end of the century! But even if we ignore all these incredibly important issues, we’re also talking about literally burning through the global reserves of fossil carbon in a little over a century and having no viable alternative plan for the future. In other words, this isn’t about “tree hugging” per se, it’s about seeing folks getting ready to cut the last tree on Easter Island and thinking: what next? Well, I’m thinking OMEGA. It’s a fundamentally different way to think about resources and technology embedded in the local environmental context. It’s about not just mining resources for technology, it’s about thinking in terms of waste products as resources and the environment as part of the system. I am passionate about this system-level thinking because in the case of OMEGA it is focused on self-sustaining cycles. By the way folks, there’s a lot at stake and so little time left for procrastination. Anything else you’d like to put out there? I have a radical proposition for both the algae community and the broader community of engineers and scientists. I’d like to propose that we come together and openly collaborate to meet the challenge of replacing fossil fuels in the next decade. I think we need to critically evaluate the idea of developing algae as an alternative fuel and we need to start thinking out of the octagon – or at least out of the pond and conventional PBR. 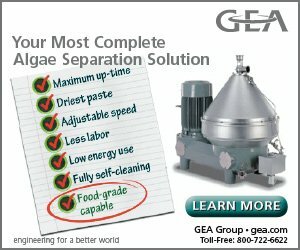 There is no doubt that we can grow algae in ponds and bioreactors and it’s a viable industry for small quantities of high-value products, but we need to face the problem of scale needed for algae-energy facilities and accept the fact that pumping seawater or wastewater to remote sites is not energetically feasible. 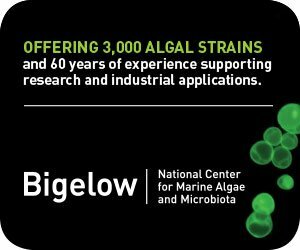 I’d like to see the algae community, wastewater engineers, marine engineers, oceanographers, aquaculturists, city planners, and knowledgable scientists take on the question of whether or not we can use existing offshore outfalls and floating PBRs to grow algae offshore in at least some locations? The OMEGA project is supported by state and federal grants. I’m a civil servant, which means I don’t have investors to please, shareholders, or production quotas to meet. In other words, I’m in a good position to critically evaluate this technology. Honestly, the more I look into it, the more difficulties and challenges I discover, but I see the broader vision of a truly integrated system, combining solar, wind, and wave energy, with algae cultivation, wastewater treatment, carbon sequestration, and aquaculture. I hope others will share and help to realize this vision. From the broadest perspective, it seems to me we’re standing on a threshold now that is arguably one of the most important in the history of civilization, comparable to the transition from hunting and gathering our food to cultivating it. We now need to make that same transition for energy. We can no longer hunt and gather it, we need to cultivate it and we need to cultivate it in sustainable and environmentally conscious ways. If we can find the pathway to this transition – and we don’t have much time to do it – it will be our legacy for future generations. If we do not at least try, then what?